The 2006 St. Petersburg Interim Compliance Report reviews progress made on selected commitments set out at the 2006 St. Petersburg Summit for the period of July 20 to December 31, 2006. The preface and summary of the findings are listed below. The interpretive guidelines used to assess compliance on each commitment are also available. Each year since 1996, the G8 Research Group has produced a compliance report on the progress made by the G8 member countries in meeting the commitments issued at each leaders' summit. Since 2002, the group has published an interim report, timed to assess progress at the transition between one country's year as host and the next, and then a final report issued just before the leaders meet at their annual summit. These reports, which monitor each country's efforts on a carefully chosen selection of the many commitments announced at the end of each summit, are offered to the general public and to policy makers, academics, civil society, the media and interested citizens around the world in an effort to make the work of the G8 more transparent and accessible, and to provide scientific data to enable meaningful analysis of this unique and informal institution. Compliance reports are available at the G8 Information Centre at <www.g8.utoronto.ca/compliance/>. The G8 Research Group is an independent organization based at the University of Toronto. Founded in 1987, it is an international network of scholars, professionals and students interested in the activities of the G8. The group oversees the G8 Information Centre, which publishes, free of charge, analysis and research on the G8 as well as makes available official documents issued by the G8. For the 2006 Interim Compliance report, 20 priority commitments were selected from the record 317 commitments made at the St. Petersburg Summit, hosted by the Russian Federation from July 15 to 17, 2006. This report assesses the results of compliance with those commitments as of December 31, 2006. This year, the G8 Research Group in Toronto and the State University Higher School of Economics (HSE) in Moscow are collaborating on the reports for Germany and Russia. For this interim report, the Toronto team had final responsibility for all Germany scores and the HSE team had final responsibility for all Russian scores. Instances where the Toronto team disagreed with a score for Russia are noted throughout the document. Both teams will collaborate on the final compliance report that will be released in May 2007. To make its assessments, the G8 Research Group relies on publicly available information, documentation and media reports. In an ongoing effort to ensure the accuracy, integrity and comprehensiveness of these reports, we encourage comments and suggestions. Any feedback remains anonymous and would not be attributed. Responsibility for this report's contents lies exclusively with the authors and analysts of the G8 Research Group. The work of the G8 Research Group would not be possible without the dedication of many people around the world. In particular, this report is the product of a team of energetic and hard-working analysts directed by Janet Chow, chair of the student executive, as well as Brian Kolenda and Matto Mildenberger, with the support of Dr Ella Kokotsis, Director of Analytical Research, and Laura Sunderland, Senior Researcher. The University of Toronto's G8 Research Group has completed its fifth annual Interim Compliance Report, based on the results from the G8's compliance from July 2006 to January 2007 with their 20 priority commitments reached at the 2006 St. Petersburg Summit. This six-month period allows for a compliance assessment with the summit's priority commitments at a time when the hosting responsibility transferred from the Russian Federation to Germany on January 1, 2007. 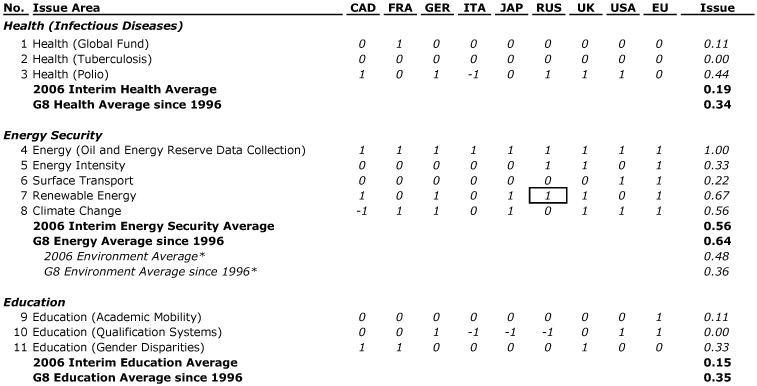 The interim compliance scores are summarized in Table A, with individual analytic assessments by country and issue area in the sections below. The final compliance report, due to be published just prior to the 2007 Heiligendamm Summit, will provide a more detailed and comprehensive set of compliance results. This report is intended to assess the compliance results mid-way through the year, following the transition in the hosting rotation, and hence offers preliminary observations based only on the interim findings to date. This report spans 20 priority commitments, including three from the Summit's 'Fight Against Infectious Disease' theme (Global Fund, Tuberculosis, Polio), three from the Summit's 'Education for Innovative Society in the 21st century' theme (Academic Mobility, Education Qualification Systems, Gender Disparities), and five from the Summit's 'Global Energy Security' theme (Oil and Energy Reserve Data Collections, Energy Intensity, Surface Transport, Renewable Energy, Climate Change). Each priority commitment is surveyed across all G8 countries plus the European Union (EU). The University of Toronto's G8 Research Group has completed its fourth annual Interim Compliance Report, based on the results from the G8's compliance from July 2005 to January 2006 with their 19 priority commitments reached at the 2005 Gleneagles Summit. This six month period allows for a compliance assessment with the summit's priority commitments at a time when the hosting responsibility transferred from the United Kingdom to the Russian Federation on January 1, 2006. 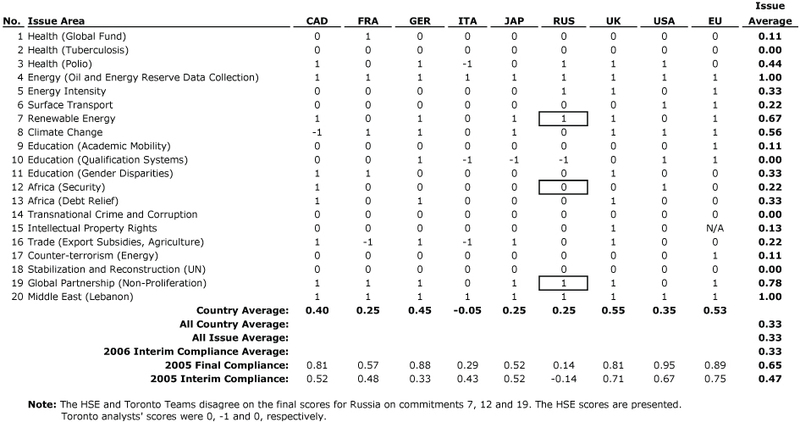 The interim compliance results reveal that from the period following the conclusion of the 2006 St. Petersburg Summit until January 2007, G8 members and the EU have achieved a compliance score of 0.33 (see Table A). This average is based on a scale whereby 1.0 is equivalent to perfect compliance and -1.0 means that the member governments are either non-compliant or are, in fact, doing the opposite of what was committed to. A score of "0" suggests a work in progress, whereby a commitment has been initiated, but not yet completed within the one year time frame. 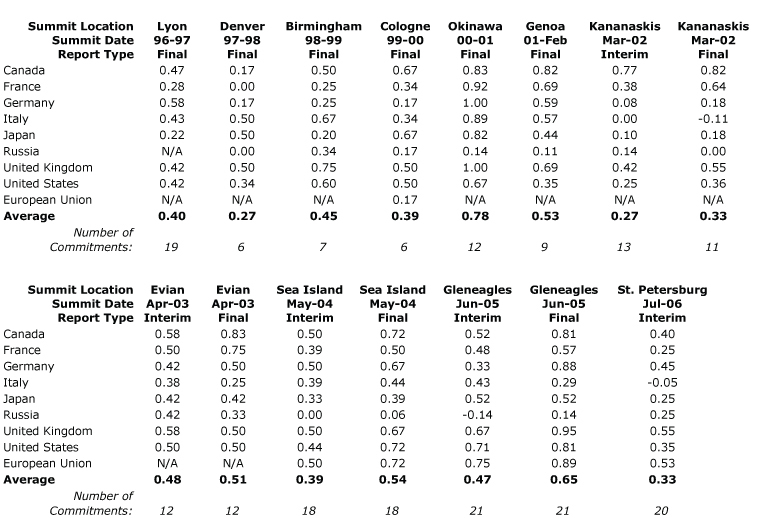 The interim compliance score of 0.31 is significantly lower than interim compliance at recent G8 summits including 0.47 for Gleneagles (2005), 0.40 for Sea Island (2004), and 0.47 for Evian (2003), and only slightly higher than 0.25 for Kananaskis (2002). Traditionally high-compliant United Kingdom sets the compliance standard across all 20 commitments observed again a score of 0.55, followed closely by Germany at 0.45, a significantly better ranking than its seventh place ranking at a similar point during the Gleneagles compliance period. In fact, Germany has already achieved the same level of compliance with its St. Petersburg commitments than its historical average total compliance score. Canada follows with a compliance score of 0.40, maintaining its historically high compliance position, though it still marks a modest decline from previous interim compliance rankings that placed Canada at or ahead of the compliance pack. The United States, with a compliance score of 0.35 ranks fourth, a return to historical averages after unusually high interim compliance during last year's Gleneagles compliance period. Tied for 5th are Japan, France and Russia, all with compliance scores of 0.25. For Japan, this represents a sustained rise in summit compliance rankings. Russia's score is a marked improvement from a similar point in last year's Gleneagles reporting period. By contrast, Italy falls in its compliance levels and becomes the only G8 country to score in the negative range, with an interim compliance score of -0.05. For six of the eight G8 member countries, as well as the European Union, the interim compliance score is down relative to their compliance score at a similar point during the Gleneagles compliance period. These declines range in scope from a -34% decline for Italy, to a -8% decline for Canada. By contrast, Germany bucks this trend and records an 9% increase in its compliance score relative to its Gleneagles interim compliance, and Russia improves 28% in its compliance over a similar period last year. After reaching a high at nearly 0.90 for the Gleneagles Interim Compliance period, the compliance gap between member countries decreased significantly to 0.59 (0.54 for the United Kingdom to -0.05 for Italy). This compliance gap is comparable to the 0.50 at the interim point post-Sea Island but still higher than the 0.25 at the interim period post-Evian. At a similar point post-Kananaskis, where the overall compliance level was comparable to that described here for the St. Petersburg summit, the compliance gap was still substantially higher, hitting 0.77. At 0.22 are commitments regarding the development of sustainable methods of surface transportation and the elimination of trade-distorting subsidies to agriculture. This latter agricultural commitment is notable in that its constituent national compliance scores were unusually polarized with four scores of +1, three scores of 0, and 2 scores of 1. A commitment to create websites in each G8 country providing information on intellectual property rights ranks next, with a low interim compliance score of 0.13, closely followed by three commitments that registered a similarly depressed score of 0.11: one to improve academic mobility, one relating to the protection of global energy infrastructure from terrorism, and one relating to the development of the African Standby Force. Four commitments saw aggregate compliance scores of 0  one relating to the fight against transnational crime and corruption, one regarding the financing of the Global Fund, one supporting the Global Plan to Stop TB, and one regarding the sharing of information about academic qualifaction systems. In all except the last of these, all G8 countries and the EU received a common score of 0, indicating a unanimous "work in progress". Unlike previous years, no commitments had scores in the negative range. The Russian government identified three thematic priorities for the St. Petersburg summit: energy security, infections diseases, and education. Compliance in these issue areas varied. Five representative commitments were drawn from the energy security summit document. 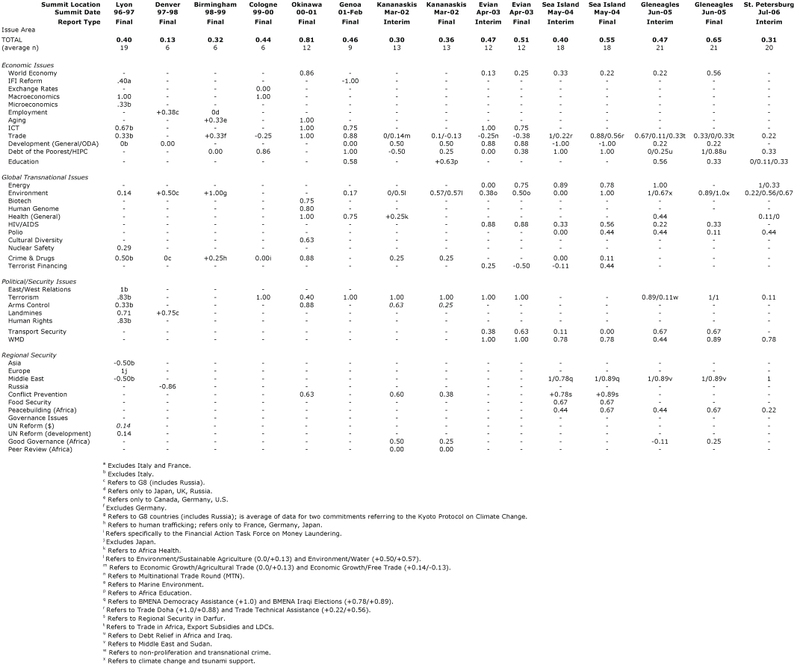 These had an average compliance score of 0.53, substantially higher than the overall interim compliance average of 0.31, and but below G8 historical compliance averages with energy and environment commitments (see Table D). Compliance with the infectious disease and education commitments was more depressed, with the G8 registering average compliance scores of 0.19 and 0.15 in those areas, respectively  well below the average 2006 interim compliance score as well as average historical interim compliance levels in health and education.. In evaluating the results of this report, the following considerations should be kept in mind. Compliance has been assessed against a selected set of priority commitments, rather than all commitments the last summit produced. The priority commitments selected were not randomly chosen but identified according to a disciplined and systematic process intended to produce a representative subset of the total according to such dimensions as issue areas, ambition, specified time for completion, instruments used and, more generally, the degree of precision, obligation and delegation of each. The aim is to provide a comprehensive portrait of the compliance performance of the summit as a whole. As such, the individual commitments selected cannot in all cases claim to be the most important ones in their appropriate issue area, nor do they necessarily represent that issue area lodged. In addition to the specific commitments assessed here, summits have value in establishing new principles in normative directions, in creating and highlighting issue areas and agenda items, and in altering the publicly allowable discourse used. Furthermore, some of the most important decisions reached and consensus forged at summits may be done entirely in private and not encoded in the public communiqué record. Some commitments inherently take longer to be complied with than the time available between one summit and the next. In some cases, it may be wise not to comply with a summit commitment, if global conditions have dramatically changed since the commitment was made or if new knowledge has become available about how a particular problem can best be solved. As each of the member countries has its own constitutional, legal and institutional processes for undertaking action at the national level, each is free to act in particular cases on a distinctive national time scale. Of particular importance here is the annual cycle for the creation of budgets, legislative approval and the appropriation of funds. Commitments encoded in a G8 communiqué may also be encoded precisely or partially in communiqués from other international forums, the decisions of other international organizations, or even national statements such as the State of the Union Address in the U.S., the Queen's Speech in the UK and the Speech from the Throne in Canada. Without detailed process-tracing, it cannot be assumed that compliant behaviour on the part of countries is fully caused by the single fact of a previous G8 commitment. Compliance here is assessed against the precise, particular commitments made by the G8, rather than what some might regard as necessary or appropriate action to solve the problem being addressed. With compliance assessed on a three-point scale, judgements inevitably arise about whether particular actions warrant the specific numerical value assigned. As individual members can sometimes take different actions to comply with the same commitment, no standardized cross-national evaluative criterion can always be used. Comments regarding the judgements in each case, detailed in the extensive accompanying notes, are welcome (see below). Because the evaluative scale used in this compliance report runs from 100 percent to +100 percent, it should assumed that any score in the positive range represents at least some compliance with the specific commitments made by the G8. It is not known if commitments in other international forums or at the national level on occasions such as the State of the Union Address, Queen's Speech or Speech from the Throne, etc., are complied with to a greater or lesser degree than the commitments made by the G8. It may be that commitments containing high degrees of precision, obligation and delegation, with short specified timetables for implementation, may induce governments to act simply to meet the specified commitment rather than in ways best designed to address core and underlying problems over a longer term. In some cases, full compliance by all members of the G8 with a commitment is contingent on cooperative behaviour on the part of other actors. The report was compiled in conjunction with the team from the State University Higher School of Economics. Canadian and Russian analysts collaborated on the reports for Germany and Russia, but the Toronto team had final responsibility for all Germany scores and the HSE team had final responsibility for all Russian scores. Instances where the Toronto team disagreed with a score for Russia are noted throughout the document.